A space starts as a lonely noun. Eventually it might be filled with other nouns. A space becomes a place when it is full of buzzing verbs. Project teams, team coaches, and community builders, often have the notion of space as the means to facilitate and channel interaction between team members. Space is our latitude and longitude. Place requires a bit more thought and adaptability. Space provides our locus, but not our focus. We’re located in a space, but we act in place. In the oft-cited PARC paper Re-Placing-Ing Space (Harrison and Dourish, 1996), the authors draw from experience in architecture and urban design, and their research findings, to make a distinction between space and place vis-à-vis collaborative environments. Harrison and Dourish argue it is the notion of place that frames interactive behavior in real and virtual space. Place derives from a tension between connectedness and distinction, rather than from a three-dimensional structure. Think of the symbiotic relationships of a bee colony in a three-dimensional hive. In A Place of My Own, author Michael Pollan argues that thoughtful crafting of space has the potential to give us a place in the world that serves our bodies, minds, and aspirations. A place is a space that is valued like a home might be valued over a house. Harrison and Dourish point out that the same physical space can function as different places at different times framing the appropriate behavior. We fill our places with cultural expectations and notions of appropriate behavior. Places exist within a space. A place is within a space where we’ve added social context and cultural understandings that help frame and cue behavior. Something is out of place when it feels out of context. 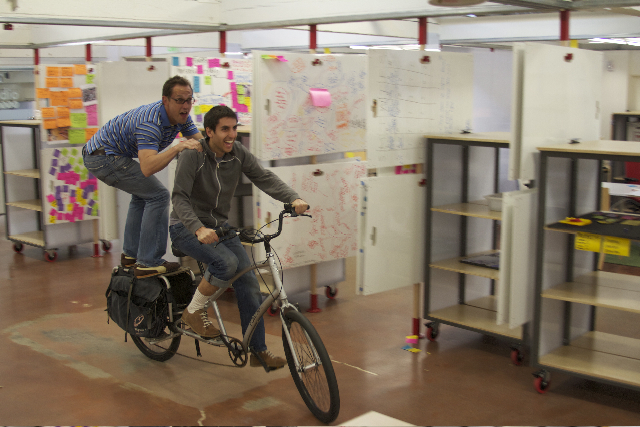 Stanford d.school believes we can design for innovation. Planners, students and staffers have spent six years brainstorming, designing, and tweaking their environment to make it fertile ground for ideas. every nook, cranny, and fungible wall system has been smartly designed to maximize collaboration. I will be following the d.school and Fast Company’s findings with interest.